Some facts about Uranium requirements going forward. BP, BHP We read and hear a lot of misinformation in the mainstream media about nuclear energy and its use world wide. Many countries expect to be forced to use more nuclear power in their systems, that no matter what you may read or hear. It is basic economics, and inevitable. Japan is now pursuing new sources of Uranium, and it is Uranium that is the fuel for nuclear plants. Analyst in the sector are saying Uranium supplies are looking tight in the face of potentially large new demand. They are forecasting strong growth in nuclear power centers on China, India, and Russia. The populations of these nations are huge, and are among the lowest consumers of electric power in the world. According to British Petroleum’s “Energy Outlook 2030″ NYSE:BP study, the countries will increase their use of nuclear power 7.8% per year through Y 2030. That means the nuclear power demand from those countries will more than double by Y 2020 and will grow 4 times that by Y 2030. Putting that into a global perspective; the world has 436 active nuclear reactors today with a total capacity of 374 gigawatts (GW). Another 62 reactors are under construction and will add 63 GW of capacity. Each gigawatt of increased capacity requires about 200 metric tons of Uranium per year. And the 1st fueling for new reactors require between 400 to 600 metric tons of Uranium, according to the World Nuclear Organization. So, the 62 new plants will need a minimum of 25,000 metric tons of Uranium in their 1st yr of production and 12,400 metric tons per year after and ongoing. According to the World Nuclear Organization, total demand for uranium will hit 67,990 metric tons in Y 2012. The 62 plants under construction will raise that 18%. Food for thought, there are another 484 reactors on order, planned, or proposed. These potential reactors represent 542 GW of electric power. When those reactors are built, they will more than double the world’s existing nuclear facilities. On the Uranium supply side the supply is likely not to easily meet demand, what with the economic uncertainty, the huge capital costs, and negative public sentiment toward nuclear power. The highest-profile supply problem was BHP Billiton’s NYSE:BHP decision to delay its Olympic Dam mine expansion, taking 14,545 metric tons of Uranium per year out of the supply chain. Plus, the Kazakhstan government shelved about 4,500 metric tons of new projects recently. 3,600 metric tons per year put on hold. 5,000 metric tons per year put on hold. reduced by 1,800 metric tons per year. That is about 29,550 metric tons of Uranium per year of expected supply has been curtailed. This could create a substantial supply squeeze over the next few years. This is now basic economics 101, when supplies are low and demand is high, prices will rise. 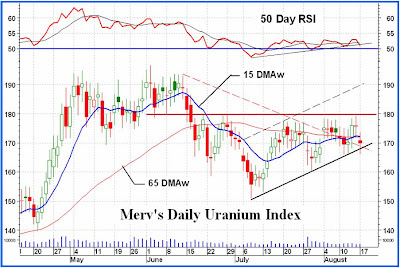 And that most often means gains can be had when Uranium prices enter a its next Boom.